Aikido is a way of coordinating both body and mind through the training and discipline of learning technique, thereby energizing the body and increasing awareness. Aikido is a modern, non-violent, non-aggressive Japanese martial art, which was developed early in the twentieth century by Morihei Ueshiba (1883-1969). “Aiki” means “blending body with mind to the movements of energy.” “Do” means “a way or path chosen towards self-realization.” As a system of self-defense it employs techniques based upon circular motions that blend with the attack and energy of your opponent. Aikido is primarily practiced as an empty-handed art (tai-jutsu, meaning “body arts”). We study a variety of responses to grabbing or striking attacks. Rather than meeting the force of an attack head on, the defender moves his or her body out of range, taking the attacker’s balance and culminating the technique in either a throw or hold-down. As a student progresses, he/she studies the principles of Aikido through the use of the bokken (wooden sword), jo (wooden staff), and tanto (wooden knife). Weapons work reveals the importance of proper distance, timing, and precision of body movement. It also develops a student’s breathing and concentration. 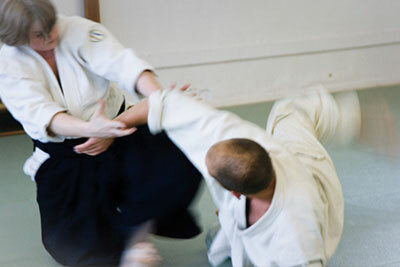 The movements of aikido are generally smooth and fluid. Circles and spirals predominate in the techniques. In the rhythm of practice, partners change roles allowing each to feel both aspects (attack and defense) of the technique. The general atmosphere of training is one of mutual cooperation and respect. Aikido is a way of coordinating both body and mind through the training and discipline of learning technique, thereby energizing the body and increasing awareness. Learn the First Steps to begin your practice.